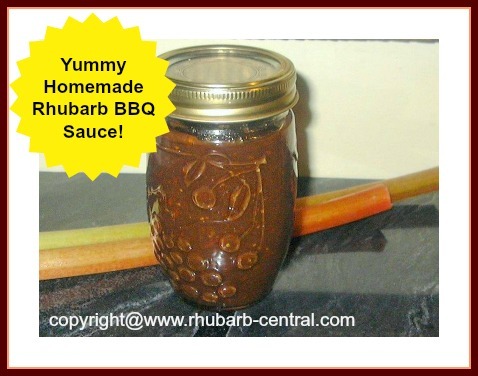 Here is a Rhubarb BBQ Sauce that everyone will love - a homemade canned barbeque sauce with onion, raisins, Jalapeno pepper, honey and more! Enjoy this sauce on baked chicken, salmon, shrimp, beef or pork! 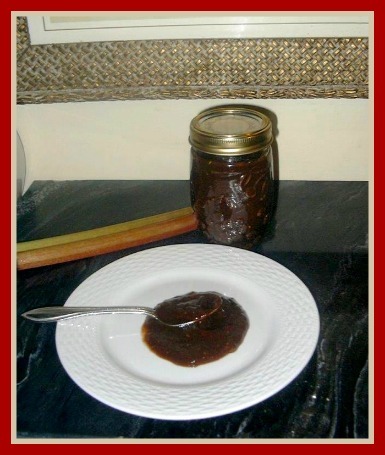 This recipe and pictures, were kindly submitted by a website visitor, Raye S. so that all visitors to Rhubarb-Central.com can enjoy this great-tasting rhubarb recipe. Thank you very much for sharing Raye S. ! Combine all the ingredients in a large pan and cook over low-medium heat until mixture comes to a gentle boil. Allow mixture to simmer for 30 minutes, stirring often to prevent sticking and burning. Transfer mixture to a blender and blend gently until mixture is of a smooth consistency. Ladle sauce into clean, hot pint jars, leaving at least 1/2 inch head space. Add lids and rings on pint jars. Remove from heat and allow the jars to rest in the boiling water bath canner for another 5 minutes, then remove the jars (keeping them upright). All jars to cool and label. Makes at least 3 pints of delicious Barbeque Rhubarb Sauce!